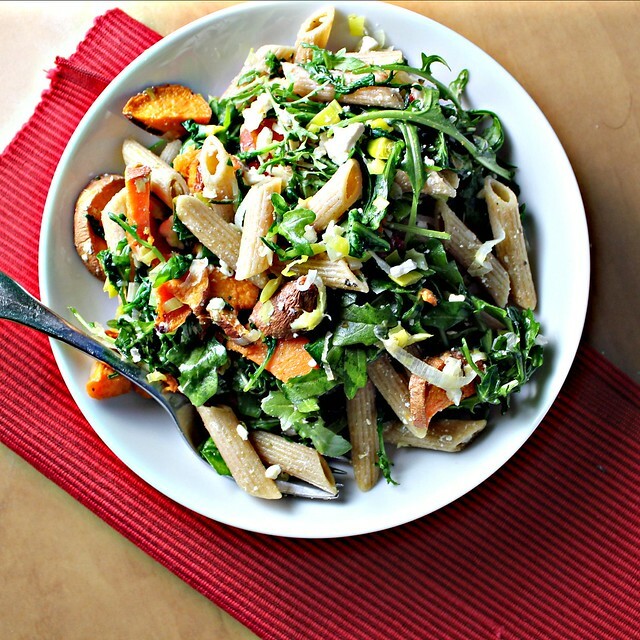 Pasta with Roasted Sweet Potatoes, Feta and Arugula…Eat.Live.Be. for a Better 2011! Here’s what keeps me up at night. You know all of those commercials for weight loss regimens, diet pills, exercise programs. Etcetera. You know how at the end, they all tell you to “consult your doctor before making any significant dietary or lifestyle changes”? The fine print. Black box warning. FDA-mandated disclaimer. Well. Someday. Someone will stroll into my office and ask me whether they can join Weight Watchers or run a marathon or go on a soup diet. Or my mother will call me and tell me about this itchy rash that she has on her neck and ask me whether or not, in my professional opinion, I think it’s cancer. Or she could be thoroughly impatient and not even wait until I know anything about medicine to ask me this. In fact, she could have asked me on Saturday. Just a hypothesis. My point being that someday. Someone is going to call me wanting answers. Answers about nutrition and diet and exercise. And, based on the medical training I am going to have had, which includes barely any nutrition and nothing about exercise. I’m kind of afraid that I’m not going to be able to answer them. And this is the source of the gray hairs that I’m currently sprouting. Although those might be due to the fact that I’ll be one year older in approximately eleven days. Hard to say. So while I’m still an amateur at this whole medicine thing. I plan on deferring to a real expert. These 5 simple tricks will help improve your nutrition status, and quite possibly your waistline. 1. Snack on fruits or vegetables. Eating low-calorie, high-fiber snacks between meals can help curb hunger and increase your nutrition each day. Also, this allows for a bit more flexibility in choices at meal times. Remember, try to get in 5-9 fruits a vegetables a day! 2. Switch to whole grain. Most any carbohydrate favorite is available in a whole grain version — brown rice for white rice, whole wheat pasta for white pasta, and so on. Grains are a great way to meet your daily vitamin, mineral, and fiber needs without giving up the foods you love and crave. 3. Don’t drink your calories. While juice with breakfast, a soda at lunch, and a glass of wine with dinner are certainly pleasureable, they add little to no nutritional value while providing a shocking number of calories. Save caloric and alcoholic beverages for special occasions, in moderation, to trim loads of calories from your diet. 4. Dine-in. It doesn’t matter where you go to eat, chances are you will eat more calories (plus fat and sodium!) than if you were to dine-in. Or, offer to host a get-together in your home so that you can control the menu while still being social. 5. Don’t get bored, try new foods and recipes. Spend time at the grocery store checking out new products and make it a goal to try a new, healthy recipe on a regular basis. There are free, healthy recipes littered all over the internet. Planning weekly menus and meals can be a huge help, as well. Thanks so much, Nicole! Love you girl! That being said, I am not a total dimwit when it comes to nutrition. And so the one thing I plan to recommend to all of my future patients. Is to eat sweet potatoes. For they are the most nutritionally dense vegetable out there. They are loaded with vitamin C, calcium, potassium, and vitamin A, are full of fiber, and are low on the glycemic index. Thus, I am sharing with you today a meal that has been nutritionally optimized (especially for those of us in marathon training gear, who need our carbs as well as every possible vitamin imaginable in order to get our muscles to where we need them to be). 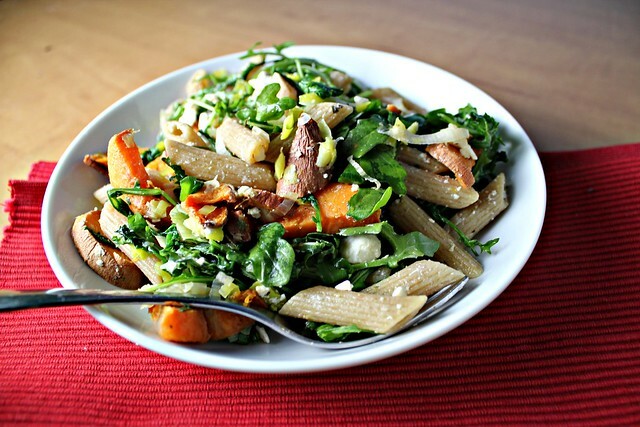 Sweet potatoes, arugula, leeks, whole wheat pasta. And, of course, some feta cheese which has just enough fat to let us absorb all of the fat-soluble vitamins that sweet potatoes has to order, but not so much that our arteries will be clogged by it. Hot damn. Plus it tastes damn good. In my most authoritative and professional opinion. This pasta is loaded with good for you ingredients, like sweet potatoes, arugula, and a healthy dose of feta! 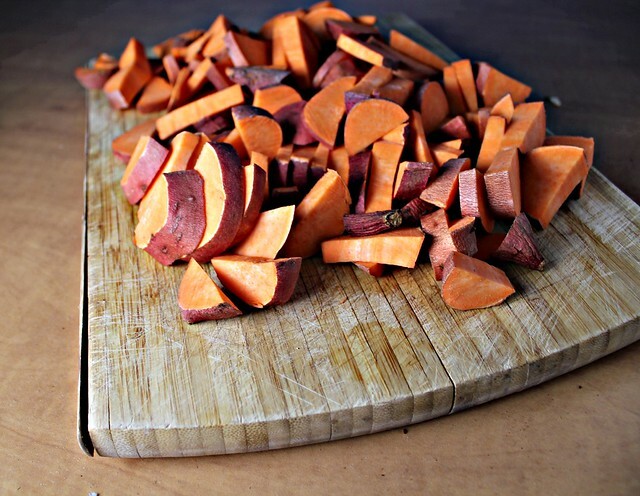 Toss the sweet potatoes with 1 tbsp oil, salt and pepper. Spread on a baking sheet and roast at 400 for 30 minutes or until soft and browned. Place 1 tbsp oil in a small skillet. Add the leeks and rosemary and cook for 7 minutes, or until soft and golden. Cook pasta in boiling, salted water. Drain and place in a large bowl. Toss with sweet potatoes, arugula, leeks and feta. I am submitting this to this week’s Presto Pasta Nights hosted by Pia of Cook Healthy, Meatless Mondays hosted by Chaya of My Sweet and Savory, Midnight Maniac Meatless Mondays hosted by Rebecca Jean of Midnight Maniac, and the Hearth and Soul Blog Hop. 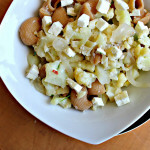 Pasta with Cauliflower, Walnuts, and Feta…Eat.Live.Be! 114 Responses to Pasta with Roasted Sweet Potatoes, Feta and Arugula…Eat.Live.Be. for a Better 2011! First of all i loveee that intro to ur blog:-)Cool and perfect! SOmeday when u are asked for answers (i think u already are ), i know for sure , despite what medical school teaches or not , u will have them all , and the answers will be tried and tested one’s , something u know for sure , for real! As u blog , u strike a balance , of good food ,nutritious , highly appetizing and most of all delicious + there is always space for treats and u have lods of those thrown in for good measure (yeah i still cant get over the ITalian cookies and Jelly bars:-) )….u are the real rockstart gurl! I will be here , to hug u with love , wish u the v best , and cheer on…. It really is pathetic how little nutrition training there is in med school!! You will be way ahead of the curve, girl! Sweet potatoes are one of my faves!! Just bookmarked this one – It sounds great. Yes, this looks to be just what the doctor ordered! Except for the arugula, all the ingredients are in my kitchen and asking to be organized into something delicious. I love sweet potatoes with anything but have never had them with pasta – this definitely looks like an awesome marathon training dish! This salad looks so delicious and infinitely better than most salads I would get eating out (unless I paid a ridiculous sum of money for it.. in which case it would HAVE to be better based on principle). Good luck with the marathon training! I sent you an email about wine.. did you get it? I think you will do fine when people ask you nutrition and fitness questions. I don’t think there is a magic bullet. I like Michael Pollan’s Eat Food. Not too Much. Mostly Plants. Love the sweet potatoe and feta combo. I’ve never loved sweet potatoes more – thank you for not posting heart shaped brownies today. Just sayin’. Most doctors lack bed side manner, not answers to nutritional information. And if that’s the case, I have a feeling you’re going to be juuuust fine. Joanne, what a great post! the tips are fantastic and your pasta looks so delicious! Happy Valentine’s Day! I bet you will get a lot of specific questions as a doctor. People always want me to tell them exactly what to eat for some reason, instead of general guidelines. It’s hard keeping up with all the fads and trends and crap out there! next, Doctor, Doctor, it hurts when I do this… If you can’t fill in the punch line, your education is suffering. Next, “Don’t drink your calories”… While true, have you stopped drinking??? Next, I would add to your AMAZING list of 5 truths, artificial have their own issues. Don’t use fake sugar, don’t drink diet soda. This is the one tip I stick to religiously, and I believe has had the biggest impact on my health. And finally, please don’t hate me when I totally rip off this meal for one of my meatless meals. ugh I know TOO much about “nutrition” because of my eating disorder! Th crazy thing is that people used to ask my for weight loss tips when I wan like super-duper-not-healthy-skinny! If someone asks me for diet tips, I tell them to use super glue as lip balm. Great tips from Nicole! And I love this dish, Joanne. The sweet potatoes are a great touch…I’m not sure if there’s truth to it, but I’ve heard that they are basically THE healthiest thing you can pick up in the produce department. I don’t know if it’s true though…wish I could remember where I heard that! I roasted sweet potatoes for V day today too. 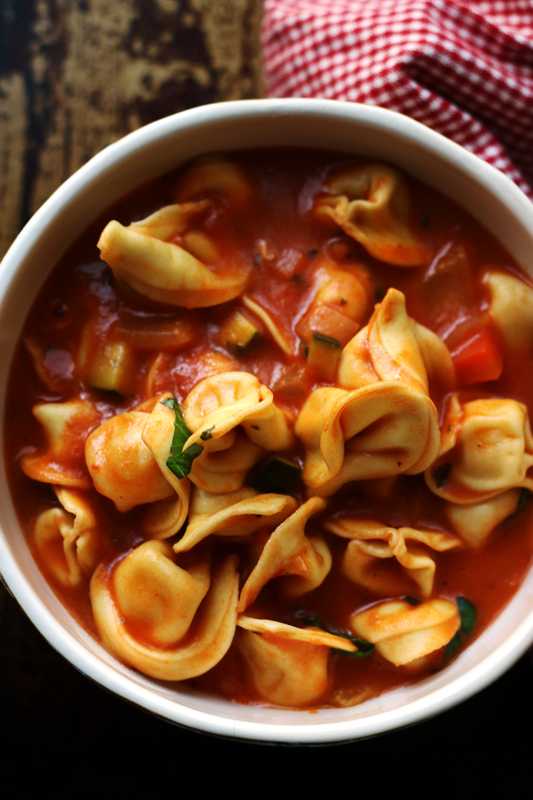 I may try this recipe sans the whole wheat pasta (just don’t love it). Great tips and I love this recipe. My kids have both taken to sweet potatoes and I have been thrilled but, had no idea they were so good for you. Thanks for that … makes me feel like I am feeding my kids even better. Can I share a funny coincidence? Yesterday my mom gave a lecture and spoke about being aware of your sugar intake. She was referring to processed foods, but her audience just couldn’t get the picture. One gentleman wa especially concerned with knowing how much sugar was in a sweet potato. I kept thinking, listen mister, if a sweet potato is your number one concern, you’re probably okay. I’m telling you right now – you’re going to be that person I’m reaching out to for answers. So get ready girl. haha In the meantime, you can ward off any questions with this pasta. It looks amazing. I love you, happy valentines day. Haha I’m eating a sweet potato while reading this post. How meta. It is so crazy how little nutritional training there is in med school. There actually was recently an article about that in the NY Times. 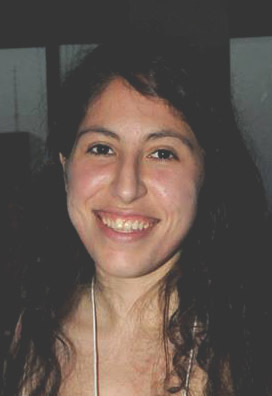 One doctor, who’s son happens to currently be in NYU med school, started nutritional classes at various med schools across the country and has tried to institute healthier hospital meals. Love the tips from Prevention RD. Simple and straightforward. Thanks! PS. I gave you a blog award! This dish looks delicious, and it’s great that all those vitamins and nutrients are packed in there. I couldn’t forego the feta, so I’m glad you gave a little shoutout about the fat helping with absorbing all the good stuff. This looks delicious. In fact, I would be willing to try whole wheat pasta again just for this recipe. With my love for feta and arugula and the sweet potatoes, I am sure I could handle a whole wheat pasta. We need our carbs too! The salad sounds delicious, adding tooth paste on mosquito bite is new info. I will try next time. I think you should send your future clients to this site 🙂 Happy Sweet Potato lovin’ Valentines Day !!! It not only looks healthy and flavorful, it looks absolutely delicious too! You have an amazing collection of pasta dishes on your blog.I really hope to try quite a few of them some day..This pasta again looks yum.I have never seen or eaten sweet potatoes in pasta..I think they will taste great with feta.Quite innovative and I loved the last picture. Good, solid advice that’s doable. Over the last year, I’ve switched to whole-wheat pasta and sweet potatoes (over white potatoes), with no problem. I like the leek/arugula/feta combo which would be yummy tonight. And roasted sweet potatoes . . yum. great tips! and they all seem so attainable! 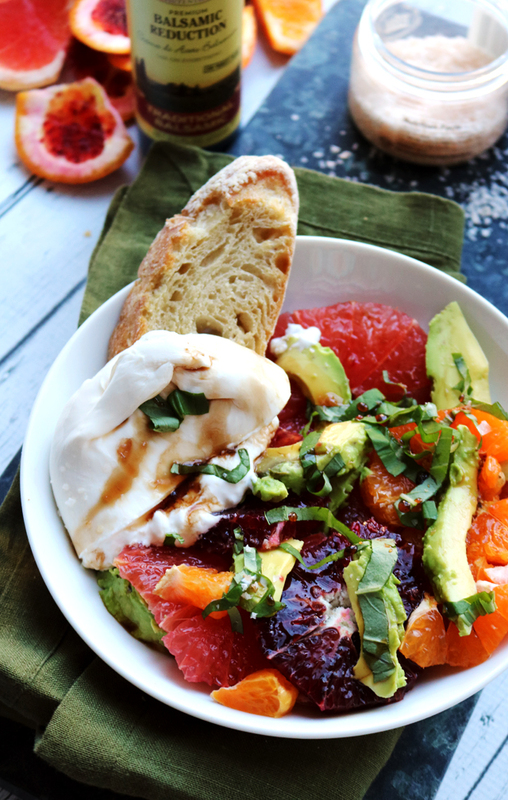 love this dish, a total power meal full of amazing flavor! Great advice, Dr. Joanne, and a delicious, healthy pasta dish. It sounds great! Great tips! I won’t mind eating well when it looks as delicious as that pasta! Good tips! I try to follow those pointers too. oh, arugula and feta cheese, this just cheer my Monday up! This looks really tasty. I never thought about putting sweet potatoes in pasta. Sounds perfect. excellent tips! and stay away, far away from processed foods. the chemicals in those things are dangerous. I love this dish. It not only is very healthy it sounds really delish. I even think my kids would for this one. mmm.. sweet potato and feta! that can be a dip as well.. This looks delicious, Joanne. I’m so making it:) I am really. I have just about everything to it, so I must…! What an incredibly delicious pasta – love the sweet, salty and savory flavors! If anyone asks you could direct them right to your blog and your goldmine of healthy recipes! thanks for the squito bite tips! This looks amazing. Love all the ingredients! Loooooove the sweet potatoes! Those are some great tips too- the one about eating in is particularly on my mind right now. I went out for a friend’s going away party this weekend and woke up the next morning with “sausage fingers” because of all of the salt in the food. I always love your use of sweet potatoes and kale and arugula…and squash. I think you rock with the healthy eats. I was just thinking today that I needed to put together a few more dishes like yours. This pasta looks fantastic! I am Greek so feta is in my table at least twice per week. 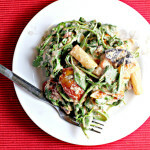 Beautiful pasta dish Joanne and the combination of veggies pasta and feta is irresistible. Thanks, Joanne! I have always heard that med students get little to no nutrition education and that is crazy to me! Most every chronic disease can, at least in part, be traced back to a nutritional problem. You obviously care about nutrition and medicine and I admire that SO much! Plus, you’re a damn good cook/baker and nothing short of HILARIOUS and hence, I <3 you! And your blog! 🙂 P.S. Sweet potatoes do seriously rock! Great photography shots! 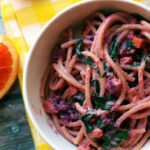 This pasta looks awesome, sweet potato greatness! I am trying to figure out nutrition for our family…hopefully we will get it down soon! PS wanted to let you know I used your recipe for Green Jasmine Rice in my latest post. It was so so good! Thanks! This is the kind of combo I would never dream of on my own. But now that I see it – wow! I would love this and I have a feeling it will make it on our menu soon! 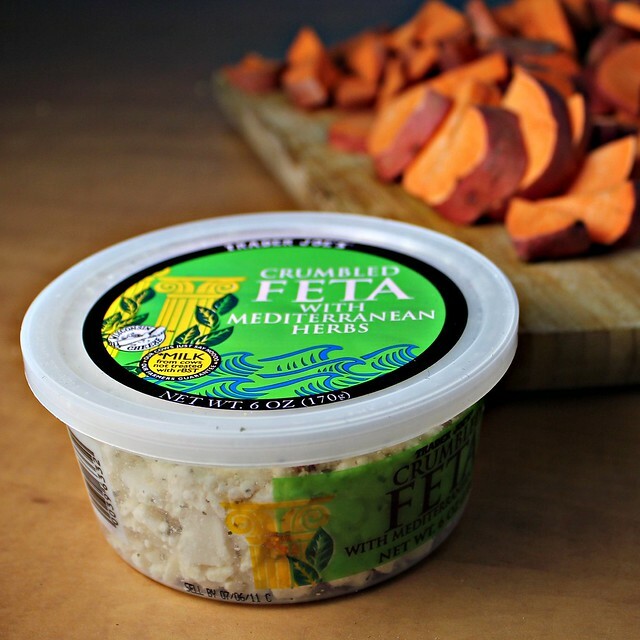 Mmmm…sweet potatoes, feta, pasta…I’m seriously sold right there. What a wonderful sounding dish! This seems almost impossible since I like to cook so much, but I just had my first successful run with sweet potatoes last week and now I am jazzed to try more recipes. This one looks great! Really, is there anything better than roasted sweet potatoes? OMG. So good. And in your list of eat well, be well, #4 is the stickler. Absolutely you’re tempted to eat more, but yet you want to be able to join your friends and nothing’s worse than a dieter in the group. You have to be twice as cheerful as everyone else so as not to be a damper on drinks and food. I know, ’cause I’m still on one. Going to be difficult when my son and his family come down next week. Great tips! #5 is my favorite, I’m all for trying new recipes! Love the combination of flavours in this dish, especially feta is one of my favourites! That pasta dish looks so good. The sweet potatoes got me and of course the feta was the ultimate trap. I’ve got to try that delicious combination. Great job! Wow!! absolutely gorgeous! I cannot wait to make this at home. It looks so delicious!!! Plus I love all the health info. I can attest to the fact that your mom did ask you if you thought she had skin cancer, haha. Your friend made some great tips about being healthy. I think you’re on the right track with this recipe, the whole wheat pasta and the sweet potatoes, yum! I never thought of sweet potatoes with my pasta. I am an idiot because this looks AMAZING! This looks filling and healthy. I’ll have to try it before my next long run! A terrific pasta, I like the sweet potatoes and feta combination! You certainly took those 5 tips and made the most of them with this dish! This recipe is loaded up with whole grains and lots and lots of veggies. I’ve never done the whole pasta with potato thing before but I know it has to be a magical combination. Looks delicious Joanne. This looks so yummy! I love the idea of sweet potatoes and feta. That pasta is just packed with goodness! This looks delicious! 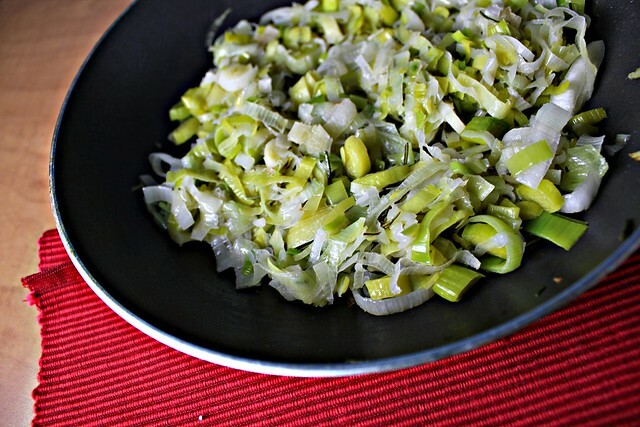 I have a wee bit of an obsession with leeks…and, well, pretty much every other ingredient in this pasta. 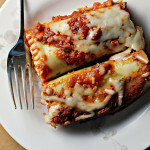 Wow… looks so inviting and I have my fork ready to dig in…awesome combination of ingredients Joanne!! This sounds delicious! I love all the flavors! Another amazing dish to behold! Beautiful! I do think Americans eat out too much – it’s amazing how much fat and calories are poured into restaurant food….dabs of butter at the end…tons of salt too! Thanks for sharing tips on eating healthy. Love the addition of sweet potatoes in this pasta dish. Looks very appetizing! I love your professional opinion, that it tastes good. If you ask me, enjoying your food is a big key to being well nourished. 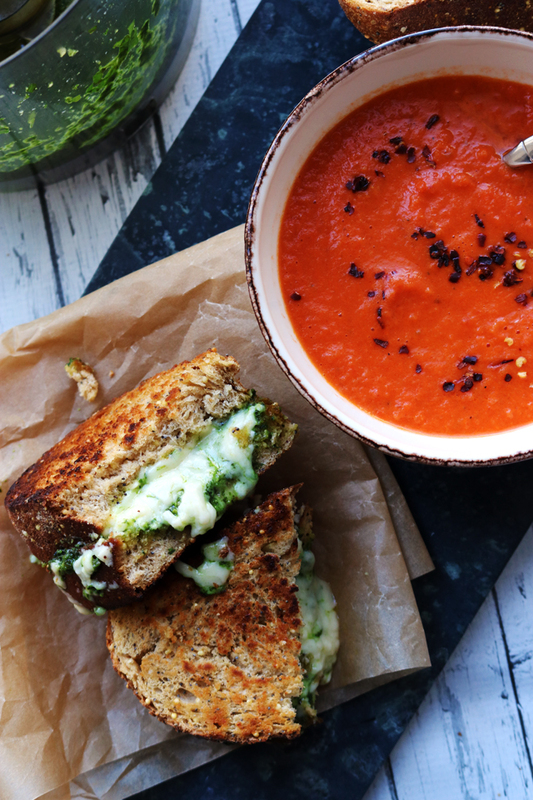 Your recipe looks delish, thanks for sharing with the Hearth and Soul hop. Sweet potatoes are quite a new ingredient to me… and it sounds like a great idea to add them to these delicious pasta -I could put arugula everywhere – so, you bet that they look super tempting to me!! Perfect mix of sweet, tangy, creamy, soft! Sweet potatoes should find their way in more people’s mouths. Believe me – you already know much more about nutrition that most doctors. They have their gov’t issued charts and lists and a food pyramid that is brought to you by the most aggressive of lobbyists. And I have stopped myself a couple of times from emailing you with medical questions! I love your super-pastas. 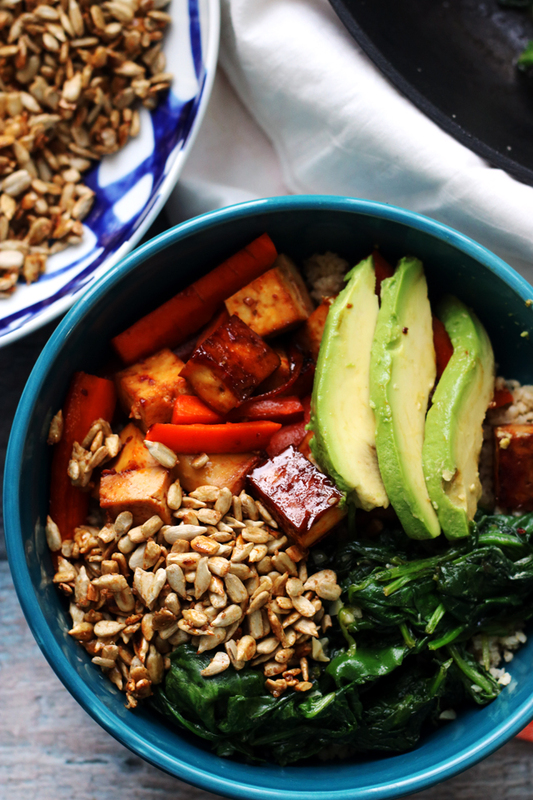 A meal in a bowl and so delicious. ? Great post. I love the tips and, naturally love the pasta. I never appreciated sweet potatoes until I started South Beach Diet years ago. Thanks for sharing with Presto Pasta Night. Your dishes always makes the roundups special. Mmmm sweet, salty, and bitter. What a wonderful balance of flavors and healthful too. Thanks for this beautiful pasta, Joanne! You never fail to make me smile, Joanne! Default medical advice from now on, put toothpaste on it. Check! I want to make this tonight and I just might be able to. Off to print it. Thanks for linking another of your great recipes at My Meatless Mondays. Get that nutrition right. I can’t tell you how many doctors know less than I. I don’t really think it is great when a doctor diagnoses celiac and then tells one to come back when he has info on what to eat. just tasted the sweet potato. Really, you are my hero right now, thank you again for this recipe! You create the kind of pasta dishes I’m always looking for!! this was divine. next time I might add a touch more rosemary. we just used mixed leaf lettuce from the garden for the arugula.